“My introduction to the classical guitar and its South American repertoire occurred more or less simultaneously and quite by chance. Captivated by both the music itself and the texture of guitar’s sound, I enrolled for classes immediately. 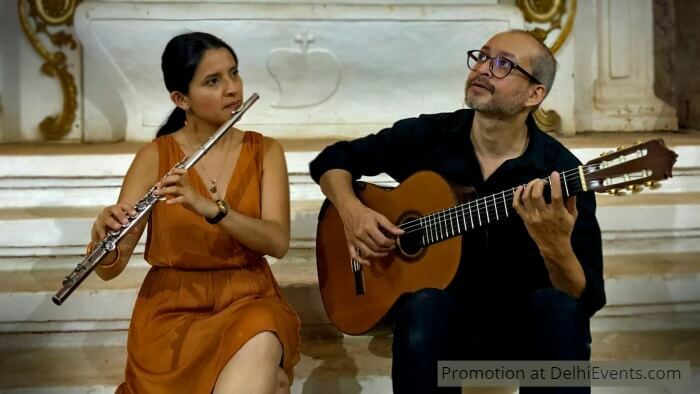 A large number of composers have written for the flute and guitar, a combination that works well because of the innate qualities of the two instruments. The flute is primarily a melodic instrument, while the guitar can be played in a variety of ways, as a rhythmic accompaniment and as a solo instrument as well. In the pieces we have chosen, the two work in tandem for the most part, with a few exceptions where the guitar takes on a supporting role. Nathalie Ramírez, a professional flautist, obtained her Bachelor degree from the University of Veracruz, Mexico. In the year 2010 she received the scholarship from the ICCR (Indian Council for Cultural Relations) to study in Delhi the course of Classical Hindustani Vocal with her guru Jyotika Dayal Paust. Along with these studies, she has been learning Hindustani Bansuri from Pandit Kailash Sharma in Ghandharva Mahavidyalaya, with the support of the scholarship from the Mexican Fund for Art and Culture. Nathalie has been playing both bansuri and traverse flute in many concerts and festivals in Mexico, United States and India interpreting different genres such as Classical Western, Latin-American, Jazz, Fusion and Hindustani music, both as a soloist and in ensembles and orchestras. She has been actively organizing and participating in programs and festivals such as Lokgrang Folk Festival in Bhopal, India, Raasrang Flute Festival 2012, Delhi, 4 Culturas Festival Delhi, and venues like Cervantes Institute, IGNCA (Indira Gandhi National Centre of Arts), Hungarian Cultural and Information Centre and the Embassy of Mexico in India. Shyamant Behal began playing the classical guitar at the age of fourteen, and performed regularly at concerts organized by the Delhi School of Music. He finished his Grade 8 Trinity College exams in 1998, and after completing his Bachelors in History from Delhi University, went to study in Paris with a scholarship from the French Government. He perfected his skills as a musician while studying under Geneviève Chanut at the École Normale de Musique de Paris and received a Diplôme d'Éxecution at the end of his studies. He also enrolled at the École Nationale de Musique et de Danse de Cachan, and was awarded a Médaille d'Or upon completing his Diplôme d'Études Musicales.